Now sadly closed, the V&A’s ‘Savage Beauty’ exhibition of designer Alexander McQueen was the best way of experiencing his work this summer. It explored his taste for the macabre, the fantastical, the controversial, the theatrical, and the dark twisted influences beneath each exquisitely created piece of clothing. In essence, it explored the man behind the dresses. McQueen has little of this “savage beauty”: little of his fetishising of darkness, nor anything particularly beautiful. Instead this is a cold and lifeless piece that lacks theatricality and drama. At times it is a brilliant, multi-media production. Visited by the ghostly, girlish Dahlia (Carly Bawden), the play presents a dreamlike snapshot of the designer’s life, as McQueen (Stephen Wight) promises to make Dahlia a dress and takes her on a journey that involves his likeable mentor Mr Hitchcock (Michael Bertenshaw), a nosy journalist (in this instance understudy Abby Cassidy), and motherly fashion diva Isabella Blow (Tracy-Ann Oberman) with whom he has a weird Oedipal relationship. In the process he is forced to explore his talents and question his mortality. This dream world is haunted by mannequin models come to life, who construct each set piece, catwalk around the stage and stare almost threateningly at the protagonist. Some excellent lighting (David Howe) and video design (Timothy Bird) provide mood and atmosphere. Yet James Phillips’ script meanders laboriously from the pretentious and poetic, to clunky narrative devices. As such, the pacing drags and the set pieces lack the flair or theatricality McQueen was known for. It’s also riddled with clichés. For one, the whole concept of being haunted by a ghost to question one’s life is hackneyed and lacks creative implementation. The character of Dahlia herself is an irritating, internet-obsessive - it's difficult to see why she would become McQueen's muse. And at times the use of music is laughable. Sure, all of the songs chosen were used in his fashion shows, but here pairing the character’s final epiphany with Handel’s Zadok The Priest is farcical and trite, whilst that same composer’s Sarabande fails to inject a sense of grandeur into the production. In a cast of (perhaps intentionally, yet ludicrously) overacting cartoonish characters, Wight offers a convincing, naturalistic performance as McQueen. One moment all Cockney swagger and the next aggressive, his McQueen is subtly tormented and plagued by fidgety mannerisms. Yet tormented by what? Who is this man behind the designer? 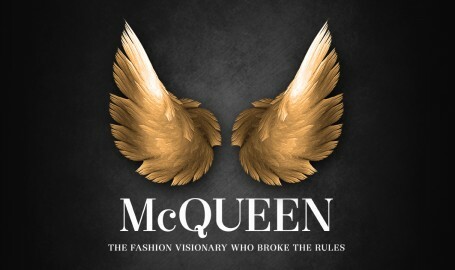 By the end of the play, we’ve endured flouncing artistry without truly exploring the core of the character, the essence of McQueen. It’s for this reason the play feels so lifeless, like the mannequins littered around the stage. Its predominant symbolism is that of “the dress”: not just a piece of clothing, but a physical representation of the woman who wears it. Ironically enough, this play is just a play; a high street frock masquerading as couture. 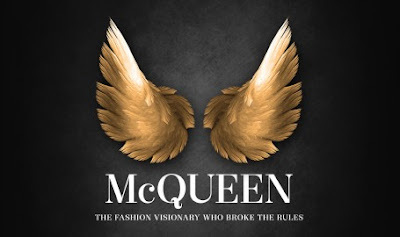 Watch: McQueen runs at the Theatre Royal Haymarket until 7th November.